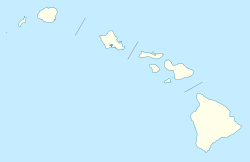 Aloha Stadium is a stadium located in Halawa, Hawaii, a western suburb of Honolulu (though with a Honolulu address). It is the largest stadium in the state of Hawaii. Aloha Stadium is home to the University of Hawaiʻi Rainbow Warriors football team (Mountain West Conference, NCAA Division I FBS). It hosts the NCAA's Hawai'i Bowl, and formerly was home to the National Football League's Pro Bowl from 1980 through 2016 (except in 2010 and 2015) and to the NCAA's Hula Bowl from 1975 to 1997 and again from 2006 to 2008. It also hosts numerous high school football games during the season, and serves as a venue for large concerts and events. A swap meet in the stadium's parking lot every Wednesday, Saturday and Sunday draws large crowds. Aloha Stadium was home field for the AAA Hawaii Islanders of the Pacific Coast League (PCL) from 1975 to 1987, before the team moved to Colorado Springs. Before 1975, Honolulu's main outdoor stadium had been Honolulu Stadium, a wooden stadium on King Street. However, it had reached the end of its useful life by the 1960s, and was well below the standards for Triple-A baseball. The need for a new stadium was hastened by the Rainbows' move to NCAA Division I. Located west of downtown Honolulu and two miles north of Honolulu International Airport, Aloha Stadium was constructed in 1975 at a cost of $37 million. The baseball field is aligned north-northwest (home plate to centerfield), as is the football field. The first sporting event at Aloha Stadium was a college football game between Hawaii and Texas A&I (now Texas A&M-Kingsville) on September 13, 1975. Played on Saturday night, the crowd was 32,247, and the visitors prevailed, 43–9. The stadium was somewhat problematic for its initial primary tenant, the baseball Islanders. Located in west-central Oahu, it was far from the team's fan base, and many were unwilling to make the drive. Additionally, while TheBus stopped at the main gate of Honolulu Stadium, the stop for Aloha Stadium was located some distance from the gate. As a result, attendance plummeted and never really recovered—a major factor in the franchise's ultimate move to the mainland. Additionally, stadium management initially refused to allow the use of metal spikes on the AstroTurf in May 1976. When the Tacoma Twins complied with a parent-club directive to wear the spikes, stadium management turned off the center field lights. After 35 minutes, the umpires forfeited the game to the Twins. The Islanders protested, claiming they had no control over the lights. However, the PCL sided with the Twins, citing a league rule that the home team is responsible for providing acceptable playing facilities. The teams ended the season in a tie for first in the Western Division and Hawaii won the one-game playoff in Tacoma. As originally built, Aloha Stadium had various configurations for different sport venues and other purposes. Four movable 7,000-seat sections, each 3.5 million pounds could move using air casters into a diamond configuration for baseball (also used for soccer), an oval for football, or a triangle for concerts. In January 2007, the stadium was permanently locked into its football configuration due to cost and maintenance issues. An engineer from Rolair Systems, the NASA spin-off company that engineered the system, claims that the problem was caused by a concrete contractor that ignored specifications for the concrete pads under the stadium. There have been numerous discussions with Hawaii lawmakers who are concerned with the physical condition of the stadium. There are several issues regarding rusting of the facility, several hundred seats that need to be replaced, and restroom facilities that need to be expanded to accommodate more patrons. Much of the rust is due to a design mistake in the choice of weathering steel to build the stadium. It was intended to create a protective patina that would eliminate the need for painting, but in the ocean salt-laden air of Honolulu, it has never stopped rusting. A 2005 study by Honolulu engineering firm Wiss, Janney, Elstner Associates, Inc. determined that the stadium required $99 million to be completely restored and an additional $115 million for ongoing maintenance and refurbishment over the next 20 years to extend its useful life. In early 2007, the state legislature proposed to spend $300 million to build a new facility as opposed to spending approximately $216 million to extend the life of Aloha Stadium for another 20–30 years. The new stadium may also be used to attempt to lure a Super Bowl to Hawaii in the future. One council member has said that if immediate repairs are not made within the next seven years, then the stadium will probably have to be demolished due to safety concerns. In May 2007, the state allotted $12.4 million to be used towards removing corrosion and rust from the structure. In 2003, the stadium surface was changed from AstroTurf (which had been in place since the stadium opened) to FieldTurf. In July 2011 the field was replaced with an Act Global UBU Sports Speed S5-M synthetic turf system. In 2008, the state of Hawaii approved the bill of $185 million to refurbish the aging Aloha Stadium. In 2010, Aloha Stadium completely retrofitted its scoreboard and video screen to be more up to date with its high definition capability. The Aloha Stadium Authority plans to add more luxury suites, replacing all seats, rusting treatments, parking lots, more restrooms, pedestrian bridge supports, enclosed lounge, and more. There is also a proposal that would close the 4 openings in the corners of the stadium to add more seats. In 2011, the playing field was refurbished in part due to a naming rights sponsorship from Hawaiian Airlines. 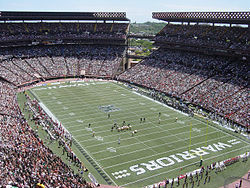 As a result of the sponsorship deal, the field was referred to as Hawaiian Airlines Field at Aloha Stadium. The airline did not renew sponsorship after the deal expired in 2016. As a result, the field went unnamed until late August, when Hawaiian Tel Federal Credit Union signed a 3-year/$275,000 agreement. As of 2016, the field is now known as Hawaiian Tel Federal Credit Union Field at Aloha Stadium. In early 2017, there was a study in the Honolulu StarAdvertiser about replacing Aloha Stadium due to safety concerns and a liability risk. The plan is to build a smaller 30,000 seat stadium on the existing property and also build commercial development around the stadium. In theory, it would save the state millions of dollars instead of renovating and keep the existing stadium as it is. In 1975 Aloha Stadium was home to the World Football League's Hawaiians. The San Francisco 49ers and the San Diego Chargers played an NFL preseason game at Aloha Stadium August 21, 1976. In August 2019 the Dallas Cowboys and the Los Angeles Rams will play a preseason game at Aloha Stadium. In 1997, a three-game regular season series between Major League Baseball's St. Louis Cardinals and San Diego Padres was held at the stadium. The series was played as a doubleheader on April 19 and a nationally broadcast (ESPN) game on April 20. In 1975, the Padres had played an exhibition series against the Seibu Lions of Japan's Pacific League. Aloha Stadium hosted the inaugural Pan-Pacific Championship (February 20–23, 2008), a knockout soccer tournament, involving four teams from Japan's J-League, North America's Major League Soccer (MLS) and Australia/New Zealand's A-League. The 2012 Hawaiian Islands Invitational was also held at the venue. The United States women's national soccer team was scheduled play a game against Trinidad and Tobago as part of their World Cup Winning Victory Tour at the stadium on December 6, 2015; however, the game was canceled the day before gameday due to concerns over the turf being unsafe to play on. On June 2, 2013, the stadium played host to a rugby league test match where Samoa defeated the USA 34–10. In June, the Brisbane Broncos from the Australasian-based National Rugby League (NRL) competition organized for a rugby league match to be played at Aloha Stadium against NRL rivals Penrith Panthers later in 2015. However, in September the NRL blocked the idea and the game didn't go ahead. Aloha Stadium is also the venue for five public high school graduation ceremonies. Radford High School, Mililani High School, Aiea High School, James Campbell High School, and Pearl City High School held their 2016 graduation ceremonies at the stadium in early June. January 3, 1997 Michael Jackson — HIStory World Tour 35,000 — These were his only US shows that decade. Also, the first person to sell out the stadium. May 29, 1997 Whitney Houston Bobby Brown Pacific Rim Tour 29,118 / 29,118 $1,634,370 Bobby Brown opened up the show singing his hit tunes. Whitney was in disguise singing background vocals for Bobby. According to audience members, "when she came out, the crowd went wild. She sang very well even though she had a cold. She closed the show with "Step by Step". January 30, 1999 Janet Jackson 98 Degrees The Velvet Rope Tour 38,224	/ 38,224 $2,664,000 The capacity for this show was expanded from the original capacity of 35,000 to 38,000 to meet the high ticket demand. February 16, 2002 Janet Jackson Ginuwine All for You Tour 32,211 / 33,511 $1,472,935 This concert was aired on HBO the following night and was later released on DVD and VHS, titled Janet: Live in Hawaii. Missy Elliot also made a surprise appearance. Rocco and the Devils Vertigo Tour 45,815 / 45,815 $4,486,532 The band's first concert in Hawaii since 1985. Billie Joe Armstrong of Green Day was the special guest. ^ a b "Hawaii Athletics – Aloha Stadium". Retrieved 11 July 2016. ^ a b Masuoka, Brandon (2003-04-29). "Aloha Stadium surface will be of NFL quality". The Honolulu Advertiser. Retrieved 2008-02-04. ^ a b Gima, Craig (2006-01-27). "Stadium corrosion creates a $129M safety concern". The Honolulu Star-Bulletin. Retrieved 2008-02-04. ^ Muschamp, Herbert (1999-01-28). "Charles Luckman, Architect Who Designed Penn Station's Replacement, Dies at 89". New York Times. Retrieved 2008-02-04. ^ a b c "Texas A and I crushes Hawaii". Spokesman-Review. (Spokane, Washington). Associated Press. September 15, 1975. p. 15. ^ "Aloha Stadium – Trivia". Retrieved 11 July 2016. ^ "Hawaii's premier Aloha Stadium Swap Meet an Outdoor Market in Hawaii|Aloha Outdoor Market, Flea Markets and Swap meet for shopping in Honolulu". Alohastadiumswapmeet.net. 1975-09-12. Archived from the original on 31 May 2009. Retrieved 2009-07-16. ^ a b Kaneshiro, Stacy. "Islanders a fan hit during 27-year run". The Honolulu Advertiser, 2009-07-04. ^ Stewart, Chuck. Sport Stew. Spokane Daily Chronicle, 1976-09-01. ^ Masuoka, Brandon (2006-07-28). "Aloha Stadium losing baseball configuration". The Honolulu Advertiser. Archived from the original on 20 January 2008. Retrieved 2008-02-04. ^ "Convertible Stadium". NASA. Retrieved August 9, 2012. ^ Kieding, Bob (2012). "Moving Seats". Popular Science. Wright's Media (October): 8. ^ "Stadium rust to get $12.4M treatment". The Honolulu Advertiser. 2007-05-11. Retrieved 2009-07-16. ^ Reardon, Dave (2006-04-03). "Super Dreams: Bringing the 50th Super Bowl to the 50th state would be costly". The Honolulu Star-Bulletin. Retrieved 2008-02-04. ^ Arakawa, Lynda (2007-05-11). "Stadium rust to get $12.4M treatment". The Honolulu Advertiser. Retrieved 2008-02-04. ^ Masuoka, Brandon (2008-06-27). "Hawaii stadium to get $185M overhaul; UH expands pay-per-view package". Honolulu Advertiser. ISSN 1072-7191. OCLC 8807414. Archived from the original on 2013-02-05. Retrieved 2013-02-04. ^ "Credit union buys naming rights for Aloha Stadium field". staradvertiser.com. 26 August 2016. Retrieved 26 August 2016. ^ "Study recommends smaller venue to replace Aloha Stadium". staradvertiser.com. Retrieved August 8, 2018. ^ "Report: Aloha Stadium now a 'liability,' cheaper to build new stadium". staradvertiser.com. Retrieved August 8, 2018. ^ Arnett, Paul; Yuen, Mike (1997-02-25). "Padres, Cardinals to play in Hawaii". The Honolulu Star-Bulletin. Retrieved 2008-02-04. ^ Carlos Alvarez-Galloso, Roberto (2007-12-26). "2008 Pan-Pacific Championship: Make it more inclusive". MeriNews. Retrieved 2008-02-04. ^ "U.S. Soccer Cancels Dec. 6 Match against T&T in Hawaii Due to Field Conditions". US Soccer. Retrieved 7 December 2015. ^ "Tomahawks get ready for match-up with Na Toa Samoa at Aloha Stadium". KHON2. Retrieved 6 January 2015. ^ "Broncos Panthers To Play Match In Hawaii". triplem.com.au. Retrieved 27 March 2016. ^ "Exhibition matches are a bad idea in the USA – just look at the Wallabies!". theroar.com.au. Retrieved 27 March 2016. ^ "King of Pop ends Hawaiian tour". Spartanburg Herald-Journal. (South Carolina). January 7, 1997. p. A2. ^ "The Pacific Rim Tour info". allwhitney.com. Retrieved 2009-09-25. ^ Events. Travel Hawaii for Smartphones and Mobile Devices – Illustrated Travel Guide. 2007-01-01. ISBN 978-1-60501-043-4. Retrieved 2011-02-28. ^ "Tickets still available for Janet concert". The Honolulu Advertiser. 2002-02-08. Retrieved 2014-04-22. ^ "Hawai'i-born dancer has Janet moving to his beat". Hawaii Advertiser. 15 Feb 2002. Retrieved 20 March 2014. ^ "U2 Honolulu, 2006-12-09, Aloha Stadium, Vertigo Tour - U2 on tour". U2gigs.com. Retrieved 27 August 2017. 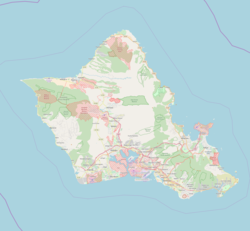 Wikimedia Commons has media related to Aloha Stadium.